Potential applications in food supplements and drug industries have created opportunities accelerated growth in the global pistachio market. As per recent researches, the phytochemical composition of pistachio hulls with a blend of anacardic acid homologues have remarkable anti-oxidant and anti-inflammatory properties. This fuels prospects for the increasing use of pistachio hulls in nutraceuticals. In a recent study, Transparency Market Research (TMR) has analyzed in detail various factors contributing the market’s expansion. The report also provides market intelligence for consumers as well as companies operating in the global pistachio market. It includes a detailed chapter presenting insights into the prevailing competitive landscape in the global pistachio market. For the purpose of the study, it profiles companies such as Setton Pistachio of Terra Bella, Inc., The Pistachio Co Food Trading LLC., Germack Pistachio Company, Rasha Pistachio Co., Sierra Nut House, Wonderful Pistachios & Almond Company LLC, Houston Pecan Company, Bates Nut Farm, Meridian Growers LLC, and Whistler Foods. In the last few years, the global pistachio market a spurt of promotional strategies, as key players took to gaining edge over the prevailing competition. Rivalry among market players is more intense at regional level, especially in higher pistachio producing countries such as the U.S. Vendors mostly fight it out on the basis of price and quality to emerge as the leading players in the global pistachio market. Some of the more established companies with a widespread reach are looking to further expand their business. For this purpose they are shifting their focus on regions with untapped potential. Such strategies adopted on part of the companies are likely to have a positive influence on the overall pistachio market. However, being a mature market, the global pistachio market is forecast to exhibit growth at positive pace through 2026. Pistachios are rich in fiber and contains antioxidants, it helps in reducing cholesterol levels, and also controls sugar. These properties are much sought-after, which has fuelled the pistachio consumption significantly among type 2 diabetes patients. In addition to these, pistachios also have high vitamin b^ content, with increases immunity levels. The rising knowledge of benefits that can be obtained from the consumption of pistachio has in turn enabled the market to gain traction worldwide. The rising number of health conscious consumers will therefore bode well for the global pistachio market. According to TMR, the global pistachio sales is expected to reach nearly US$5000 bn by the end of 2025. The demand for pistachio is further expected to increase as an increasing number of consumers discern pistachios as guilt free and rich source of nutrients. As per recent studies, pistachios are increasingly used in diverse food products such as desserts for its unique taste and subtle essence. Furthermore, they are used in bakery products such as cookies, cakes, and biscuits. In addition to this, they have found application in food joints, restaurants, and processing industries. 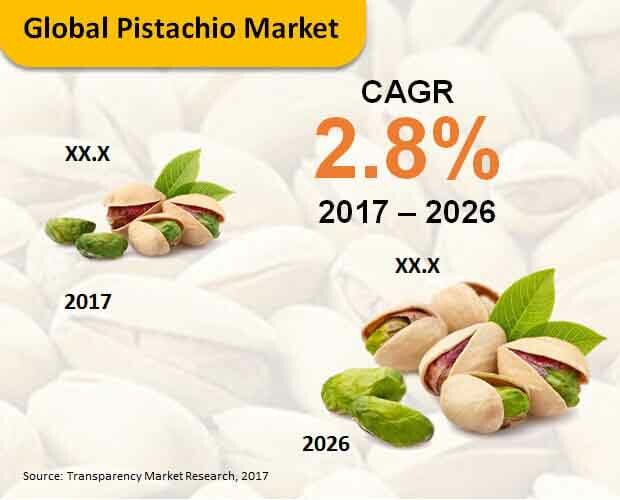 With an increasing number of food manufacturers innovating pistachio flavored products in a bid to capitalize on their growing popularity, the demand for pistachios is expected to rise steadily between 2017 and 2026.